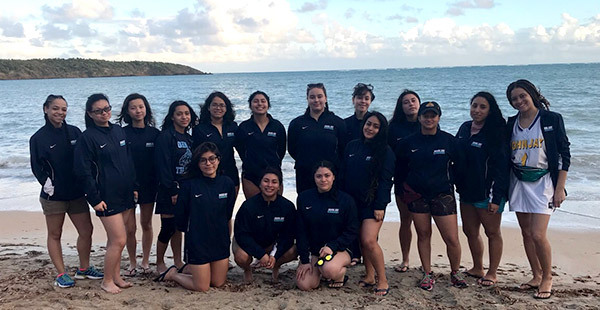 The John Jay College Women’s swim team embarked on their annual winter-training trip to Puerto Rico—but this was no relaxing getaway. Instead, the 12 women on the team faced a busy week of strenuous training meant to strengthen the team’s bond and each member’s mental and physical stamina. To make the trip a reality the women worked tirelessly from September to January, selling chocolate, baked goods, and apparel, to help fund everything from their airfare to room and board. “This is a team that knows how to make the best out of any situation,” said Brandon Fieland, Assistant Athletics Director for Media Relations. The week-long training included team workouts at the beach and in the pool. To help document their journey, the team filmed scenes from their trip and kept an online journal where each day two members of the team provided details on the day’s training sessions, challenges and triumphs.